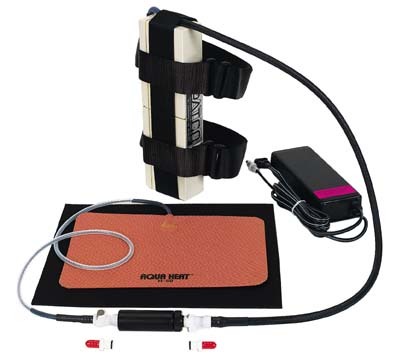 This 12 Volt system will provide supplemental heat for sport divers who are looking for a small and compact design, with low maintenance and cost. The heater is turned ON or OFF by a magnetic switch. The action of this magnetically controlled switch is smooth and precise. The 360 degree rotation with two 180 degree indents, lessens any accidental turn ON's. The switch is equipped with a red LED which glows in ON position. The system is available in 25, 35,and 50 watts. The system can also be used to power a light head from 10 to 100 Watts. 3.) 12"x 8" heating element .08"
PATCO is a manufacturer of AQUA HEAT, AQUA LITE(also know as Aqua Light) and AQUA GUNS. In simple terms, we make wetsuit and drysuit heaters, underwater lights, 10 watt hid light heads, spearguns and spearfishing accessories. Patco抯 scuba diving equipment is high quality, technologically advanced, state of the art, fully guaranteed, and are geared to safety, enjoyment, comfort, and maximum value.